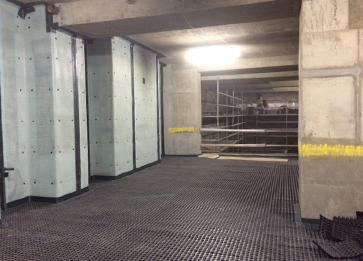 Triton’s technical team specified a sealed cavity drain membrane system as well as other waterproofing elements required in the construction of a new, two storey domestic basement. The basement has been designed to accommodate a squash court, gym, swimming pool, multi-media room, cinema, golf driving range, hot water supply and plant room. All systems were supplied by Triton including Platon P8 membrane to line all exterior walls and deeper studded Platon P20 membrane which was laid to the lower basement floor. Cavity drain membranes work by directing any water entering the wall behind the studded membrane down to a perimeter drainage channel from where it can be drained to a natural or pumped drainage point. This system included a detail to drain water down from the upper to lower basement level via Triton’s Aqua Channel drainage conduit fitted to the perimeter of the upper level floor (see detail drawing overleaf). At lower level a similar perimeter conduit drained to a system of 2 x Triton XL sumps in the floor, each fitted with 2 x Triton 303 pumps, offering a 14M maximum vertical output each. Rodding eyes were installed to the drainage conduit at 10M intervals at both levels to allow for periodic maintenance. A Triton Powersafe automatic (with battery back-up) alarm unit was installed to protect the property in the event of flooding by storing power in case of a mains power loss. Triton Anti Lime coating was applied on all new concrete to prevent the leaching of free lime and/or mineral salts from the concrete walls and floors which might create blockages in the cavity drain membrane system. Knight Build Limited, Brentwood, Essex.